"Everyone fears the Zangbeto and you can get into trouble if you go against the rules." See photos. 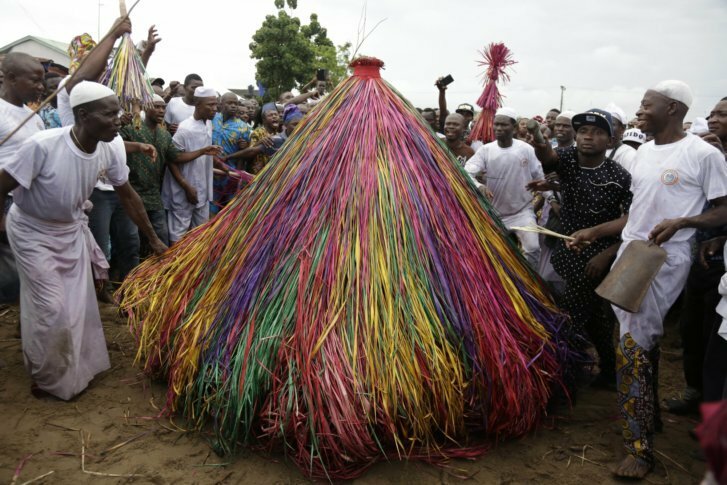 AJIDO, Nigeria (AP) — Excitement grew in the crowd as the Zangbeto Voodoo festival reached a climax, with scores of colorful palm-frond figures representing the traditional guardian of the night. Some Nigerians frustrated by crime and corruption have suggested that reviving such traditions could be a deterrent. The performance over the weekend helped to create “fear and reverence,” the chairman of the festival’s organizing committee, Sehude Adeyinka Amosu, told The Associated Press. The festival of about 2,000 people in the coastal Ajido Kingdom in Lagos State, held every three years, is one of the most important events in the local religious calendar. The Ogu inhabit coastal areas of Nigeria, Benin and Togo. The West African region once was known as the Slave Coast because of the large number of slaves taken from there over centuries. Beyond the slave trade, Ogu land is also noted for the voodoo widely practiced there. The use of the Zangbeto is said to date back to the 17th century. The beliefs hold that Zangbeto’s punishment could range from fines to the banishment of an individual. Meanwhile, he said, modern institutions like the police have failed to perform as effectively as the traditional ones they replace. Many people would rather take their case to the Zangbeto than to the police post, he said. Nigerian authorities are increasingly tolerant of such festivals and their underlying beliefs as long as they are not criminal in nature. The Zangbeto Voodoo festival had the support of the government, with senior officials in attendance. While turning to Zangbeto and other traditional figures reduces the burden on authorities, the resort to mob justice against suspected criminals, with some beaten to death, is widely seen in Nigeria as an indication of the loss of faith in the police and justice system. As crime rises, some people say traditional institutions like the Zangbeto should be revived. Even though the majority of Nigerians are Christian or Muslim, traditional beliefs remain strong. Some have even suggested that in the face of widespread corruption, authorities should take their oath of office by swearing to traditional gods rather than with the Bible or Quran. Certain gods are seen as capable of dispensing instant justice by striking offenders with thunder and lightning. “They will surely think twice before stealing public funds,” Idowu said.